What's BMT, you ask? It's sort of like a BLT. But let's be serious for a minute. Who thinks the lettuce in a BLT is as important as the bacon and tomato? It's pretty easy to get rid of, right? Some might say that the mayonnaise in a traditional BLT sandwich is more critical than the lettuce. But the "M" in my recipe isn't mayo. You see, I am a complete sucker for entering recipe contests, and this time it's all about MUSTARD. Oh, how I love mustard! So you got it now, right? BMT stands for Bacon, Mustard, and Tomato. I also love that this contest doesn't require me to beg for votes. Nope, just some recipe judging. 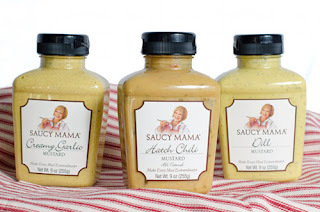 I received three different mustards from Saucy Mama, and in the first round I was challenged to create an appetizer recipe using any one of those mustards. And to make it even more challenging, a secret ingredient was announced - BACON. My husband suggested deviled eggs (probably because he's such a fan of them) and when I started brainstorming the concept, it made perfect sense. Bacon and eggs belong together. I always put mustard in my deviled eggs. And tomatoes work well with both eggs and bacon. So that's good so far. And then when I looked at the mustard choices, I saw that one included Hatch peppers. Hatch ... eggs ... get it? Oh, I crack myself up! And so the BMT Deviled Egg was born. My husband, the connoisseur of deviled eggs, said I nailed it. The mustard adds a nice tang, and the heat of the Hatch peppers cuts the richness of the egg yolks. So good. I love that deviled eggs are making a culinary comeback. (Have you noticed?) 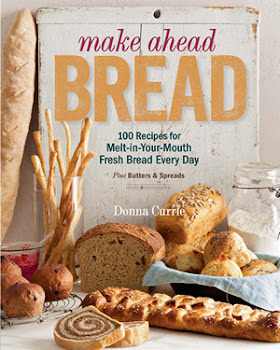 They were trendy in the old cookbooks my mom used, but then they became old fashioned. Then they became retro. Now they're becoming fashionable all over again. And why not? They're the perfect little two-bite appetizer. Cut the eggs in half, lengthwise, remove the yolks to a medium bowl, and set the whites aside. Add the mustard, pickle relish, and paprika to the yolks. Stir, mashing the yolks as you go. If it seems a little dry at this point, don't fret. Cut the tomato into a small dice and add it to the bowl. Cut or crumble three strips of bacon and add them to the bowl. Stir to combine. The tomatoes will add a bit more moisture to the yolks, but if it still seems too dry, add a bit more mustard. Taste for seasoning. The bacon adds its own saltiness, but if you prefer more, add it. Use a spoon or small scoop to fill the hole in the eggs and mound the filling over the egg - since you've added so much extra to the filling, you'll have very generously filled eggs. Chop or crumble the remaining strip of bacon and sprinkle it over the tops of the eggs as a garnish. Saucy Mama is in a generous mood, so one of my lovely readers will win the same mustards I received for the contest - Hatch Chili, Dill, and Creamy Garlic. To enter, just leave me a comment with your best (or worst) egg- or mustard-related pun. I'll bet we get some eggs-citing entries! Will yours cut the mustard? (And what does that mean, anyway?) If you're not a fan of puns, just leave a comment. The winner will be chosen randomly. For additional entries (as many as you wish - I'm not going to thwart your efforts to win some mustardy goodness) pin one of the photos of my deviled eggs on Pinterest, or Tweet a link to this contest, or post a link to this post on Facebook. (If you want to share a photo and link from this post on Facebook, you have my permission to do so.) As many times as you like. For each entry, come back here and leave a comment telling me what you did. Contest is valid for US Residents only. Contest ends on June 30, so you've got plenty of chances to pin, tweet, and share. All usual Cookistry contest rules (detailed in the tab above) apply. Maybe you don't want to wait to see if you win. So you can have a discount to buy your own products. See how much I love you? You can get a WHOPPING 25% off Sauce Mama products on their site with the magical discount code DON25 through July 17. Have fun shopping!